Honorio Banario sat somewhat uncomfortably on the short podium erected at the Kamayan Sa EDSA where he was next to Eric Kelly. Both faced over 50 media people assembled who asked questions about their upcoming fights in One Championship: Global Rivals this mid-April. At least six times, Banario was asked during the question and answer portion on how he is after his five-match losing streak, what his adjustments he will make after losing five straight, why he is still fighting after losing five straight when others would call it a career, and so on. Ironically, Banario's last win in a MMA cage was against Eric Kelly during One Championship 7: Pride of a Nation. Since that TKO win over his compatriot on an August night in 2012, Banario has gone winless. There have been 36 One Championship events since and it is now April of 2016. It has been four years since he has lost known a win. What was once a promising career that stood at an 8-1 win-loss card is now at a crossroads? Or really, is it? If those wins over the Filipino were supposed to spur on the Japanese fighter to greater heights despite being an older fighter at (then) 36 years of age, that wasn’t the case. Oishi followed up those wins over Banario with a devastating loss Narantungalag Jadambaa of Mongolia in 2014. The Japanese fighter, who had fought in the UFC, struggled with injuries that escaped him for the most part of his career. In January of 2015, he called it a career. Banario is surprised to hear of Oishi’s fate and hopes that there is still a happy ending on the horizon for him. 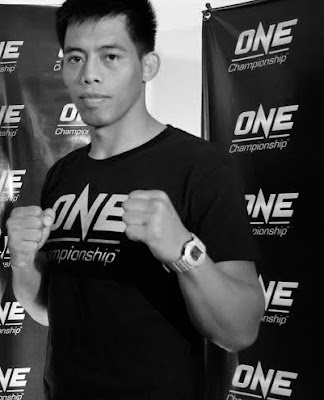 On April 15, coincidentally once more, Banario will be facing a fellow Filipino in Vaughn Donayre, a fighter out of Cebu who is — coincidentally as well — battling his own losing streak. Donayre won his first seven matches then shockingly lost three of the next four including two in One Championship. “But I have to win this April and regain my honor." Charly Suarez knew that he was in for a tough fight. The Filipino lightweight fighter up against Chinese fighter Shan Jun and a partisan home crowd. At stake was a slot in the 2016 Rio Summer Olympics and at the very least a silver medal in the Asian-Oceanian Olympic Qualifiers at the Tangshan Sports Centre in Qian’An, China. When the Chinese fighter emerged from the locker rooms, he raised his hands to acknowledge the crowd that began to applaud and chant. Suarez came out with a peaceful but determined look on his face. “Binigyan ako ng pagkakataon na makapunta sa Rio at mabigyan ng kaligayahan ang ating mga kababayan (I was given an opportunity to go to Rio and to bring some joy to our countrymen),” thought Suarez who is the Philippine delegation team captain. “Wala na makakapagpigil sa akin kahit homecrowd nila. Kukunin ko na ‘to. Bigay ko na ang lahat (No one was going to stop me from making it not even the Chinese home crowd. I was going to take this. I was going to give my all)." While Shan Jun was buoyed by the crowd, it was Suarez who was energeized. “Lalo akong naging desidido manalo (All the more I became determined to win this),” he said of the jeers. His foe was largely uncoordinated in his attacks. 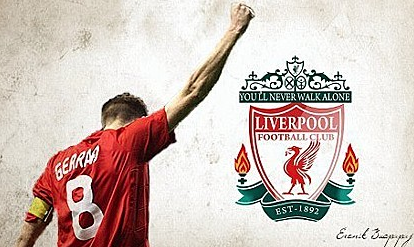 The 27-year old Suarez was on target as he landed combinations and nasty shots that rocked the Chinese. In the second round, a powerful straight broke Shan Jun’s nose forcing him to quit sending the small Filipino group in a frenzy. 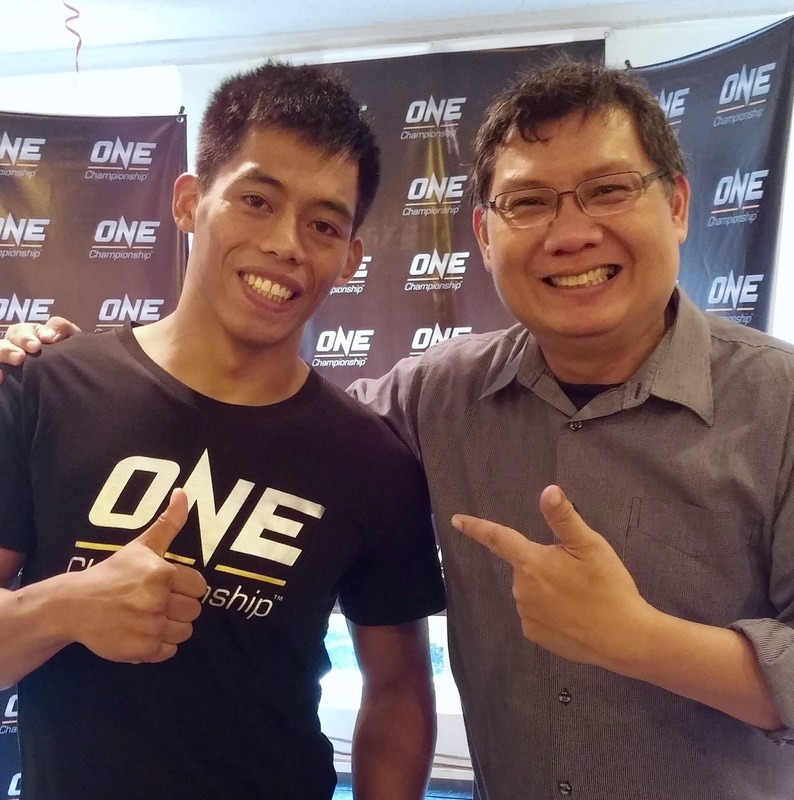 Suarez was joining Rogen Ladon, who was the first from the Philippine team to book a ticket to the Olympic Games. “Laking pasasalamat ko kay Lord para sa pagkakataon na to. At ang laking tulong ng imagery techniques namin (I owe so much to God for this blessing. 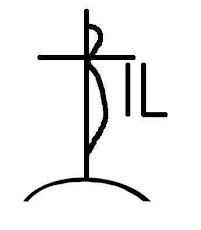 And the use of those imagery techniques greatly helped me in attaining this),” said the deeply religious Suarez. 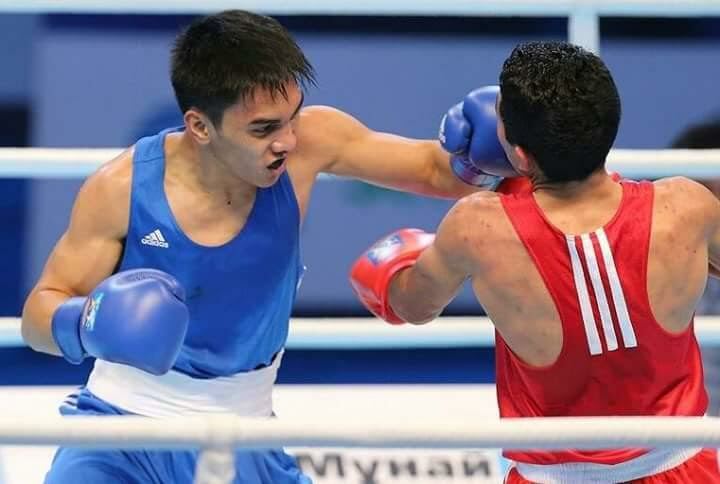 In spite of the Filipinos’ success with Ladon and Suarez now doubling the Philippine boxing contingent to the Olympics (Mark Anthony Barriga was the lone boxer during the 2012 London Olympics), there was equal hope and concern for Mario Fernandez and for Eumir Felix Marcial who both lost their semifinals matches. Between the two, Fernandez has a better chance of becoming of clinching an Olympic berth while bringing home a bronze medal. Marcial hurt his hand during his match against Iranian Sajjad Kazemzadeh Poshtiri resulting in swelling in his hand. And that was clearly evident in his match against Shakram Giyasov of Uzbekistan. “Sayang pero may laban pa (It’s unfortunate but we still have a fighting chance),” noted Suarez of his compatriots’ final hurdle. “We will find out and hope and pray for a miracle,” hoped Manalo of the two remaining Filipino boxers who are in contention for an Olympic berth. Rappler spoke with Filipina boxer Nesthy Petecio a few hours after her painful loss to India’s Mery Kom Hmangte in the quarterfinals of the Asian-Oceanian Olympic Qualifiers at the Tangshan Sports Centre in Qian’An, China. The Tuban, Sta. Cruz, Davao del Sur native was still in pain over the loss that eliminated her from making it to the 2016 Rio Summer Games in August of this year. But she gamely related her story to Rappler. That changed when she saw her older brother and some neighbours take up the sport under her father’s tutelage, that changed her perspective of the sport. “Nung makita ko yung kuya ko at ang mga kapitbahay ko nag-eensayo kasama ni Papa ay natuwa ako. Doon magsimula yung hilig ko sa boksing. I love boxing." “Pero,” she adds, “nagba-basketbol pa rin ako." The sport has governed over two-thirds of her 23 years on this planet and her father’s vision of the sport being good for his daughter is bearing fruit. At the age of 15, she took part in the 2007 Smart National Youth and Women’s Open Boxing Championships in Cagayan De Oro. Competing in the women’s 50-kilogram category, Petecio won the gold and was named to the national team. She has since brought home quite a medal haul — silver medals in the 2014 World Championships and the 2011 and 2013 Southeast Asian Games; a bronze medial in the 2012 Asian Championships; and a gold medal in the 2015 Indonesia President’s Cup — in both the featherweight and bantamweight women’s divisions. And her prowess and success has allowed her to receive an education as she attended Rizal Technological University. “Sobrang layo na ng women’s boxing ngayon. Ngayon nakikilala na yung sport,” she talked of the difference from the time she came up to how the sport is viewed today. As for the Olympic Qualifiers, despite her going out in the quarterfinals, Nesthy has remained confidence of another opportunity to bring glory to the Philippines. However, the five-foot-two-inch Petecio couldn’t resist one last dig at the officiating that robber her of her chance to go to Rio. 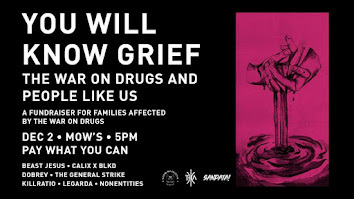 “Alam naman ng lahat ng nanood sa arena kung sino nanalo. Talo man ako pero hirap na hirap siya sa akin. It was a great experience na makalaban ang isa sa pinakakilala sa larangan ng women’s boxing." Chatting with new Ateneo Blue Eagle Raffy Verano about off-court stuff. Rick: Do you like music? If so, what recording artists, bands do you like? 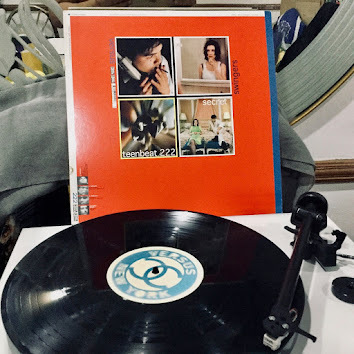 What's on heavy rotation on your music player? Raffy: I love music! I would have to say my favorite artist right now would be Kendrick Lamar. I have a little bit of everything on my playlist: hip-hop, rap, R&B, and a lot of beat based songs. Rick: Your fave kicks? And why? Are they Air Jordans? If so, what is your fave and why? Raffy: Yes, my favorite kicks have to be the Air Jordan 1's. My favorite pair of 1's are the royal and bred 1's, to me they have the cleanest and simple look to them and the color ways to it just pair well with a lot of clothes. Rick: Are you looking forward to Batman vs Superman: Dawn of Justice or Captain America: Civil War? Do you binge watch anything on Netflix? What would that be and why? Last film you saw in the theater and did you enjoy it? Raffy: I am really looking forward to watching both Batman vs Superman and Captain America: Civil War both seem like great movies. I don't binge much on Netflix. I feel like if I start to binge I'll binge for awhile and not get anything done. The last film I saw in the theater was Deadpool and I really enjoyed that movie. It was packed with comedy and action. Rick: M&Ms or snickers? Or none of them? What is your fave snack? Raffy: My favorite snack has to be oreos. Oreos are the best with milk but yet can also be too dangerous. Rick: Aside from clothes/shoes, what will you be packing with you when you come over? Raffy: I’ll be packing pictures of both my family and friends and the little things that'll remind me of home. 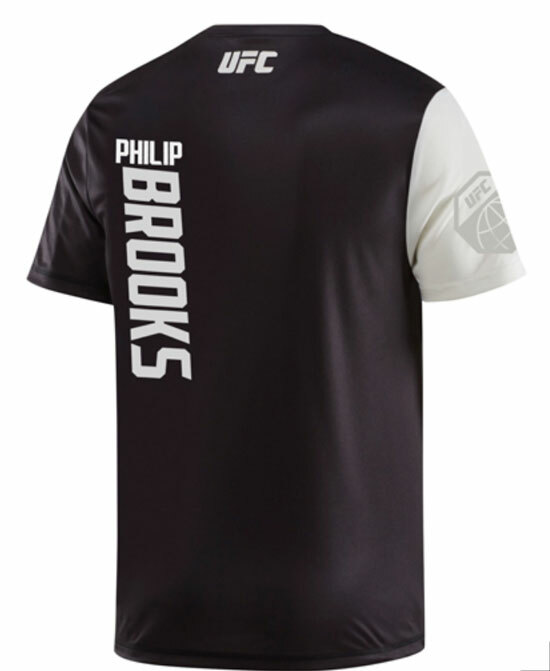 I gotta get me a CM Punk UFC shirt! Having watched, followed, and written extensively about the Ateneo Lady Eagles over the past 10 years, they have had so many personalities who have defined the team or given the sport a face. Some have even transcended the game and have become big names. One player I was fascinated with was Bea Tan. She came up from La Salle Bacolod to join a Lady Eagles team that was on the verge of winning a championship. However, because of the team’s depth, she couldn’t break into the starting six. Several years ago, during the University Games held at Roxas City, the Lady Eagles were on a roll, defeating team after team when the starting six was sent back to Manila to play in a pocket tournament with foreign teams. That left the reserves to hold the fort — Bea Tan, Mona Bagatsing, Tasha Faustino, and a few others. They faced Central Colleges of the Philippines out of Iloilo and their star Jovelyn Gonzaga. It was the reserves’ moment to shine, to show what they could do. Bea’s former high school teammates from La Salle Bacolod were on hand to cheer her on but the Lady Eagles were sent out of the quarterfinals with a three-set sweep. The team was massively deflated. They knew they had a great chance but they blew it. I remember consoling Bea who assistant coach Parley Tupaz (head coach Roger Gorayeb flew back to Manila with the first six) constantly rode during the game. Bea took over Jem Ferrer’s slot as playmaker and she tried her best to get the team going. No one seemed more disappointed than Bea that day. Even before that match in far flung Capiz, I watched as Bea found herself niche in beach volleyball where interestingly, she teamed up with Alyssa Valdez who was serving out her residency. I thought that she was a totally different player on the sand. Maybe because there are only two players per team, they both had to set for one another, hit the ball and play defense. Maybe because she was in her element. Watching her play in the UAAP and Petron beach volleyball tourneys, there was a joy to her face that wasn’t evident in the sport’s indoor cousin. I recall telling myself that Bea Tan had found her passion. So when Beach Volleyball Republic came up, I wasn’t the least surprised that she was at the forefront along with some former teammates and colleagues in Charo Soriano, Angeline Gervacio, Fille Cayetano (nee Cainglet), and Gretchen Ho. Watching Bea and her BVR colleagues, I told my oldest friend in the world, television host Boyet Sison that this is the line-up of the two-time V-League champions minus Jem Ferrer, Alyssa Valdez, and Denden Lazaro. I also pointed out that Fab Four of Fille, Dzi, Jem, and Gretchen who were a huge reason for the volleyball’s surge in popularity, here they were again helping spread the gospel of this fun and exciting sport. And as much as I have tremendous respect for her BVR colleagues, I sought Bea out to congratulate her knowing this was her baby and advocacy. What follows is a short conversation I had with Bea Tan. Rick: Congratulations on BVR and its partnership with ABS-CBN. You’ve been beaming non-stop today. 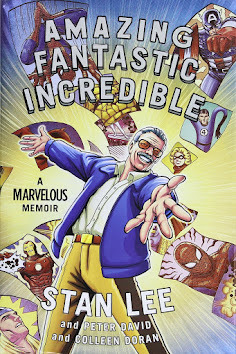 How cool is this for you? Bea: Oh, it’s the coolest ever! I have to pinch myself just to see if I am dreaming. But it’s for real. This is cool. Rick: Then it’s all good. I know this has been your passion and advocacy but how did you convince your teammates to get into this? Bea: It started out after I graduated from Ateneo in 2014. As athletes, we dream of playing in big tournaments and success on and off it. When your playing days are done, there’s this desire to continue playing. But more than playing, you want to grow the sport and create your own tournaments. I would go around the country just to look for beach volleyball tournaments to participate. I know for a fact that there are a lot of beach volleyball players but they transition into indoor volleyball because there aren’t enough tournaments for them to pay or get involved. After graduating, I took it upon myself to plan a small tournament in Bacolod. I tapped my immediate circle of friends within the Ateneo Lady Eagles to help me out. And it transitioned from there to a tournament in Manila. Gretchen (Ho) was another person who wanted to carve out her own niche and was wiling to help out. She too found her passion in the sport. From there it was easy to get everyone else. BVR is the vision of having players play out their passion for the sport. BVR is planning to get players to play and focus on their skills and to grow the sport. Ours is a country with long coastlines. People play the sport everywhere. It’s a matter of giving it more focus and attention so it will grow. Rick: Since the sport only features two players per team where each one has to set, hit, and play defense, has this improved your skills as a player? Bea: Most definitely it has. You learn how to do everything. And you have to do it well. If you look at Alyssa Valdez, it really helped her game where she has become a more complete player. And it’s the same for UST’s Cherry Rondina and many others. It has also boosted my confidence not only in the sport but also as a person. Rick: Here’s the odd question. Is it easy to get people to play in swimsuits? Or are young girls conscious about it? Bea: Believe it or not, it is the young girls who are fine playing in swimsuits or bikinis. They are more comfortable with their bodies. It’s the older players who have a few reservations as they have gained a little bit of weight after their playing days were over. They feel shy to wear bikinis. Before they would bring their own gear, usually cycling shorts. We’ve remedied that by providing them gear that will be comfortable to wear. I think that after watching the girls play and show off their skills, people will develop a genuine love for the sport more than the superficial. Rick: As you’ve been around, do you see people view beach volleyball through different eyes. Bea: Yes! While you have to credit the success and popularity of indoor volleyball in opening eyes to the sport, beach volleyball has gained a lot of popularity throughout the country. More and more people are getting into it. Before, in Metro Manila, it was only in UE Caloocan that had a beach volleyball court. Now they have in other schools as well and it event places like SM. And there are now more and more tournaments around the country. It is an exciting time for the sport of beach volleyball. With Bea, Fille, Gretchen, and Dzi. BVR is the brain trust of former collegiate volleyball stars and current beach volleyball stalwarts Bea Tan, Charo Soriano, Dzi Gervacio, Fille Cayetano, and Gretchen Ho who all used to play volleyball for the Ateneo De Manila University. Their passion for the sport has spread from the indoor courts to the outdoors, and through BVR, they hope the rest of the country will get into the exciting and entertaining 2-on-2 sport as well. As the official broadcast partner, ABS-CBN through ABS-CBN Sports + Action and ABS-CBN Sports + Action HD Ch166, will cover BVR's events all over the nation, starting with their star-studded beach volleyball tournament at the White House, Boracay on April 27 and 28. Three semifinal matches and three finals matches will be aired on ABS-CBN Sports + Action and ABS-CBN Sports + Action HD Ch166 on April 28. 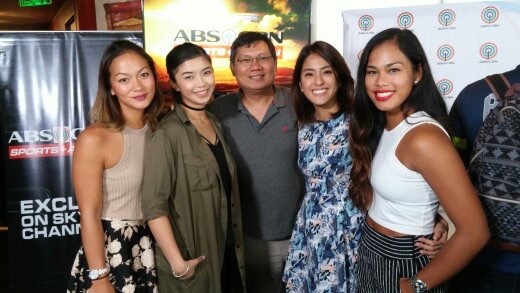 ABS-CBN Sports + Action will also feature highlights of BVR tourneys at San Juan, La Union, Anguib Beach, Sta. Ana, Cagayan Region, and Lakawon Island, Negros Occidental. BVR aims to promote the beach volleyball lifestyle in the Philippines through providing an avenue for athletes to train, develop their skills, build a community, and compete in high-level exhibition tournaments all over the country. Together with ABS-CBN, BVR will be at the forefront of promoting the sport towards the goal of making the Philippines a competitive force in the world of beach volleyball in the future. This appears in the Monday, March 28, 2016 edition of the Business Mirror. Duke University Coach Mike Krzyzewski came under fire for his post-match talk with Oregon forward Dillon Brooks after the latter threw up a three-point shot from Steph Curry range with eight seconds left despite leading 79-68. Brooks and Coach K post-match. 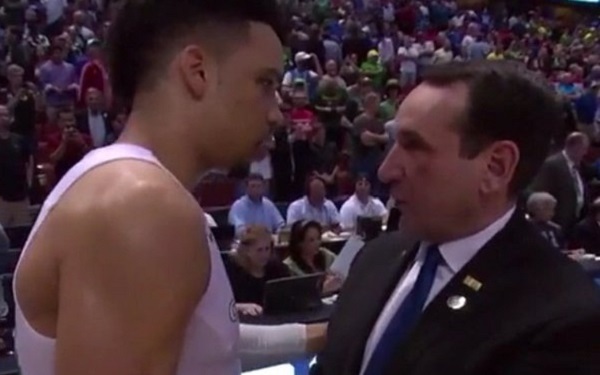 After the match, Coach K told Brooks that he was “too good of a player to do that” in reference to the late shot. Brooks apologized but the next day felt he didn’t do anything wrong. Now some quarters including Oregon coach Dana Altman say that Coach K should have spoken to the proper people and not the player. Krzyzewski apologized later for reacting incorrectly and distracting the Ducks before facing their next opponent. While I agree Coach K should have not talked to Brooks but to Altman instead, I think Oregon was wrong for rubbing it in. Now, if there is such a thing as a quotient in determining who moves on, then it is justified. Besides, no way is Duke going to catch up with eight seconds left in the match. Now if there was a good one minute then fine. Fire away. It might have been inadvertent but still it can cause problems down the road because the other team will want to get back and you can be sure some of those Blue Devils will want to settle that score. I’ve seen it happen locally. Five years ago, en route to their fourth consecutive UAAP championship, Ateneo Blue Eagle Chris De Chavez threw up an underhanded shot with about a second left from about 30 feet away. It went it further burying National University. Ateneo coach Norman Black was furious at De Chavez. About a month later, during the University Games, NU had its revenge when Jean Mbe swooped in for a dunk with seconds left in the game and the Bulldogs way way ahead. There was a near fight as some Ateneo coaches charged the NU side. One Bulldogs’ assistant mentioned the De Chavez shot. Since then, the battles between the two teams have been hotly contested. And more than a decade ago, there was a similar ending during a match between San Beda and Philippine Christian University with a Red Lions player jacking up a trey towards the match’s end. Harsh words were exchanged and that nearly led to a fight. Luckily, cooler heads prevailed. Because of today’s intense level of competition, it is easy to forget sportsmanship that is oft lacking these days. Sometimes, in the heat of the battle, people lose it or forget themselves. Also recently, Carolina Panthers quarterback Cam Newton was too down following their Super Bowl loss to Denver that while addressing the media post-match, he used mono-syllabic answers and walked out after hearing the Broncos’ Chris Harris talk about their game plan and how they stopped the potent Panthers team. I think that just as there are preparations for post-game victories so must there be for losses. Especially the painful ones. Sometimes the best end to any game, no matter how hard fought, is that gesture of class. A handshake. Consoling a vanquished opponent. Taking a knee. Or even not taking that inadvertent last shot (or not) just to pad one’s stats. As a youngster, there were three footballers I who I watched if they were on television -- Franz Beckenbauer, Pele, and Johan Cruyff. Beckenbauer was fundamentally sound and played simple but effective football. Pele had great skill and he played with a lot of flair. Johan... was doing things we didn't see anyone do. That Cruyff Turn? That was just one of them. His uncanny dribbling skills. Wow. He played with great intelligence, a keen understanding of the game. If others used speed and strength to get by defenders, Cruyff used guile, smarts, and lots of crafty dribbling. He was amazing to watch. 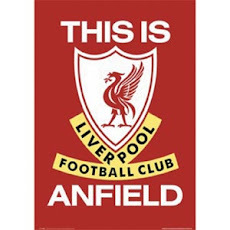 Even as I began to root for Liverpool, I also liked watched Ajax Amsterdam. I never got a LFC shirt as a youngster but the first ever football shirt that I bought? Ajax. And I still have that to this day even if it doesn't fit me at all. I tried my best to copy him on the pitch but well... let's leave it at that. 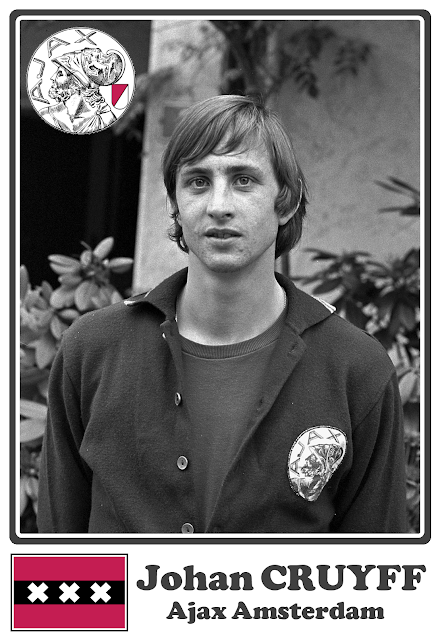 But Johan Cruyff... total football indeed. Rest in Peace, Mr. Cruyff. Thanks for the great memories. The Philippine boxing team visualzing their competition to come. You oft hear athletes say that a lot of what they do in trying to achieve their goals is mental. For boxer and Olympic hopeful Rogen Ladon, it was overcoming being just a substitute for Mark Anthony Barriga and his nerves. 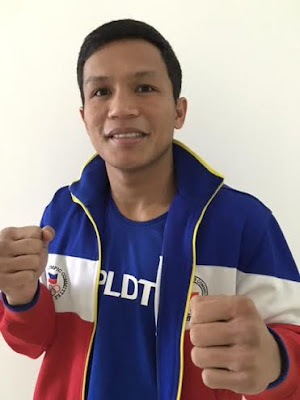 It took some time before Manalo was able to build rapport with Ladon and the other boxers who are currently competing in China for the Olympic Qualifiers. For Ladon, he was a bundle of nerves every time he competed internationally. When at home in the Philippines, the familiar surroundings relaxed him. But abroad, going up against boxers ranked higher than himself, some with a name for themselves, or worrying about biased judging, that was his stumbling block. And it affected the light flyweight pugilist's performance. “What Association of Boxing Alliances in the Philippines (ABAP) and the coaches do for the boxers is to expose them to a lot of foreign competition. The two-week camp in the United States helped for sure but we came up with a program or techniques for Rogen to use,” said Manalo. In 2015, Ladon won a pair of silver medals in the Southeast Asian Games Singapore and the Asian boxing championships. Furthermore, he was named “Discovery of the Year” by the Asian Boxing Confederation. In spite of his success, Ladon looks forward to Rio and beyond with a humbling perspective. Now that is the sound of a man looking for more things to conquer. This appears on the Thursday, March 24, 2016 edition of the Business Mirror. With their three-set loss to Ateneo last Saturday, the UST Golden Tigresses fell to sixth place. While mathematically, they can still make the Final Four, their fate isn’t entirely in their hands. For one, they have to win all three remaining matches — against FEU (March 30), NU (April 3), and UP (April 10). Second, they have to hope that UP and FEU, currently at third and fourth respectively, drop some matches. The dangerous UP Lady Maroons took a huge loss to La Salle for the crucial twice-to-beat advantage in the Final Four. At this point, UP would like to consolidate their position when they face NU (March 30), FEU (April 3), and UST (April 10), and hope that any of the top two squads drop games. UP could finish at 10-4, its best record in a long time, and give any of the top two teams a run for their money. Speaking of the top two teams, they would like to keep stick to the top two spots. Two wins will ensure them a twice-to-beat advantage. Two losses will put them in a tie with UP. While it is unlikely that resurgent Ateneo will drop any two of their remaining three matches when they face Adamson, UE, and La Salle in that order, a second loss to La Salle will drop them to second where they could face UP in the Final Four. Ditto with La Salle as they face UE (April 2), Ateneo (April 10), and NU (April 13). You can make a case that NU is playing La Salle; of course, but not with the way they have floundered. FEU needs to solidify their position at fourth with at most two wins in their three remaining matches — UST, UP (April 3), and Adamson (April 6). NU is on the outside looking in as they play UP, FEU, and La Salle. But the Lady Bulldogs are 2-2 this second round, 2-5 in their last seven matches. To say that they are reeling is an understatement. Again, they would have been better served had they played their current UAAP team in the V-League rather than let guest players bail them out. Back to the UST Golden Tigresses. They looked they righted their shaky ship after their three-set upset win over La Salle to close out their first round. They followed that up with another sweep of the hapless UE squad after which the Lady Spikers returned the favor with a three-set sweep of their own. Then they battled Adamson in a five-setter before prevailing then dropped three sets to Ateneo in a match where they were never in the game. Looking at the loss to the Lady Eagles, the young Tigresses clearly lacked maturity and big game experience while their veterans were a no show. Chloe Cortez had three points, Carmela Tunay finished with two, and Jessey De Leon ended up with one point. Marivic Meneses played better than she did in previous games but it wasn’t anywhere near enough. After Alyssa Teople faltered as starting setter, UST Coach Kungfu Reyes sent in veteran Alex Cabanos but she wasn’t able to give the team a lift. With Cherry Rondina mostly contained, UST’s only other option was EJ Laure who had problems defensively. Listening to Reyes during their huddles, he expressed disappointment that his girls didn’t seem like they were hungry for the win. He tried everything from the simple reminders to the words of encouragement to even angrily issuing instructions. At this point, it’s a maturity issue or even a leadership. With Rondina more or less contained, it fell upon the others to contribute. When it didn’t happen, they fell apart. The Holy Week break will allow them to mend bruised feelings and to get over their last loss. It will also allow time to heal niggling injuries and offer some badly needed rest. Mentally, though… that’s another concern. UST is still in the hunt for the fourth spot. The sad thing is — it is out of their hands. will increase the country’s chances of booking slots to 2016 Summer Olympics Qualifiers. The national boxers who will vie for one of three male slots and one of two female slots in their respective weight categories are: Rogen Ladon (light flyweight, 49 kg. ), Roldan Boncales Jr. (flyweight, 52 kg. ), Mario Fernandez (bantamweight, 56 kg. ), Charly Suarez (60 kg. ), Eumir Felix Marcial (welterweight, 69 kg.) and Nesthy Petecio (women's flyweight, 51 kg.). All six were part of a group of 14 boxers who went on a whirlwind 18-day training camp in four cities in the West Coast of the United States: Oakland, San Francisco, Los Angeles and Las Vegas. 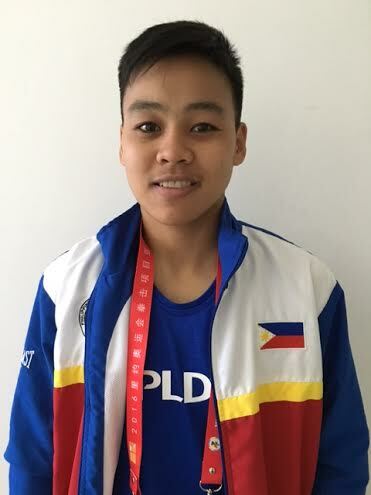 “Rogen is a silver medalist from the recent Asian Confederation Boxing Championships as well as a silver medalist in the SEA Games in Singapore,” described Picson. “He is really hungry to prove himself." “Now Boncales is coming off a long lay-off after he suffered a hairline fracture after a fight in Indonesia in 2014. He was mostly inactive last year but towards the end, he came back with a vengeance,” divulged Picson about the General Santos native. “He showed a lot of energy and determination when he edged Ian Clark Bautista who is better known as our “Heartbreak Kid” after he knocked down a Korean in the 2014 Asian Games but went on to lose the fight." According to the ABAP Executive Director, Bautista has been complaining about pain in his shoulder. “We had him checked and the results showed there was no serious injury. However, Bautista kept saying his shoulder was bothering him so we had no choice but to replace him with Boncales." “The line-up was arrived at upon consultation with the coaches who traveled with the boxers for their American trip,” bared Picson. “And that is quite a competent bunch who knows a thing or two about qualifying for the Olympics. The coach include deputy head coach Nolito Velasco, women's head coach Roel Velasco, 3-star AIBA coach and 3-time Olympian Romeo Brin, and the only female coach in ABAP, Mitchel Martinez. The China tournament has a total of 242 male boxers and 55 female pugilists from Asian countries and Oceania which is composed, among others, of Australia, New Zealand, Papua New Guinea, Samoa and other Pacific islands. Picson clarified that those who were not named to the China tourney are not out of the running yet: "There are three more qualifiers the other boxers may be entered in: the Women's World Championships (Kazakhstan) and APB/WSB qualifiers (Bulgaria) in May and the Final AOB qualifiers (Azerbaijan) in June. We will send participants there", he said. Should more than one Filipino boxer qualify in a particular weight category, ABAP will have to choose only one entry to the Summer Olympiad in Rio de Janeiro in August as mandated by the International Boxing Association (AIBA). The National University Pep Squad successfully defended its National Cheerleading Championship (NCC) last Sunday at the Mall of Asia Arena in Pasay City. NU emerged triumphant in a field of 16 collegiate teams in the Coed College Cheer competition tallying a whopping 340.5 points; 23 points ahead of first runner-up University of Perpetual Help System Dalta that finished with 317.5 points. Far Eastern University was named second runner-up with 301.5 points. 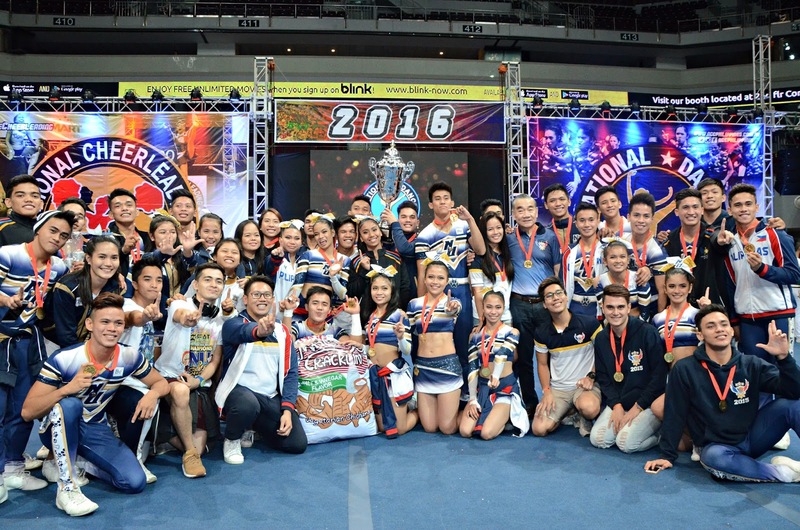 It was NU’s third NCC title over-all and it caps their scholastic calendar that began with a bronze finish at the International Cheerleading Union (ICU) World Cheerleading Championships in Orlando, Florida in April of 2015 and their third consecutive UAAP CDC championship. 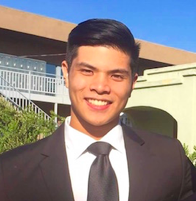 NU will be losing 10 seniors to graduation by school year’s end. “The NCC is just getting bigger,” said NCC President Carlos Valdez. “We started out before with only a few schools. This year, over 300 schools participated in the competition. Every year, we see teams levelling up in terms of skill and performance. As for NU, I think they responded well to the challenge of other schools like Perpetual Help, FEU, UST, and Arellano University. For sure next year will be even more exciting." The National University Pep Squad successfully defended its National Cheerleading Championship this afternoon at the MOA Arena. 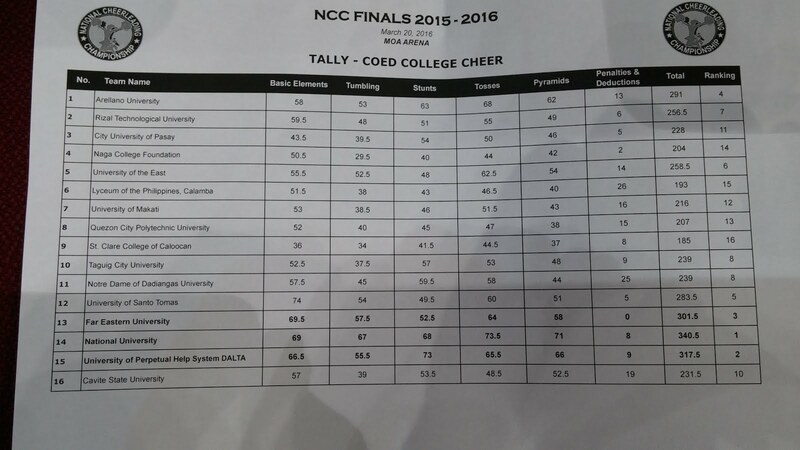 In the Co-Ed College Cheer Division, NU scored an impressive 340.5 total points; 23 ahead of first runner-up University of Perpetual Help that finished with 317.5 points. Far Eastern University was second runner-up with a total of 301.5 points. The NCC title is NU's third overall. There were questions about the Ateneo Lady Eagles heading into their second round match versus UST. The sudden injury to middle hitter/blocker Maddie Madayag is a huge loss for the two-time defending champions. However, adversity is something this team is used to. Two years ago, they libero Denden Lazaro got injured. Last season, Bea De Leon and Aerieal Patnongon also got injured. Although all three came back to play, this is the first time the team has lost someone for the remainder of the season. When you think about it, that’s two they lost. Katrina Tolentino got injured during the team’s first match of the collegiate conference of the Shakey’s V-League season. And Michelle Morente was knocked out on account of academics. So technically, that’s two out because of knee injuries and one due to studies. Two are key players while one is an up-and-coming one. Even before the start of Season 78, the Ateneo Lady Eagles were dealt a bad hand. It makes it harder but when has something worthwhile been easy? It never is. They haven’t played that intense since Opening Day against NU. My gripe this year is that the team has lacked that killer instinct. Last season, they simply inflicted one beating after another on foes. This year, because Ateneo isn’t as good defensively, they haven’t looked sharp. There are stretches where they are back to their devastating selves but never for an entire game maybe except against UE but come on. That’s UE! You’re expected to do that against a team that has been winless in the past four seasons. Of course, a lot of other teams have leveled up. But that isn’t the point. It’s about intensity. Following the consecutive losses to La Salle and UP, I was somewhat disappointed that they didn’t throttle fragile NU from the start of the match. Against UST, they stepped on the gas pedal and mostly never took their foot off. And for the first time this season, those devastating serves were back. They were better defensively. And they also played Cherry Rondina much better than their first meeting. Defensively, they were so much better. Eight huge block points against UST? And UST is rated higher defensively than Ateneo. Bea De Leon and Amy Ahomiro came up big! This is the time for the two of them to reassert themselves. As a team, the Lady Eagles also received and dug much better as well this time around. Jia Morado is bringing it. 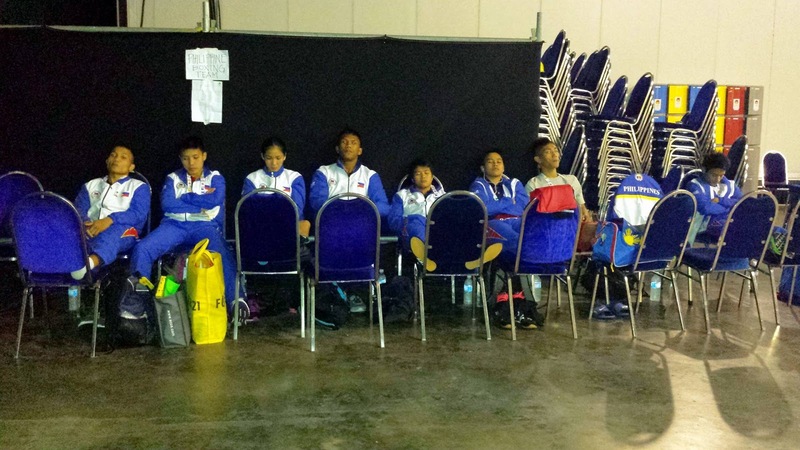 After Maddie went down, Jia Morado was thinking of her offensive options. But good and smart players find ways. For the third consecutive match, Morado had over 30 excellent sets. She had 27 in the losing effort against UP. Two key moves: Kim Gequillana returned to the starting lineup while Amy Ahomiro slid back into to occupy Maddie Madayag’s spot. When Jhoana Maraguinot finally got to play last season, it was Kim Gequillana who sort of lost playing time. There was the main weapon in Alyssa Valdez with Bea De Leon, Amy Ahomiro, Morente, and Maraguinot who provided able support. Gequillana became a bit play. A tactical substitution if you will. 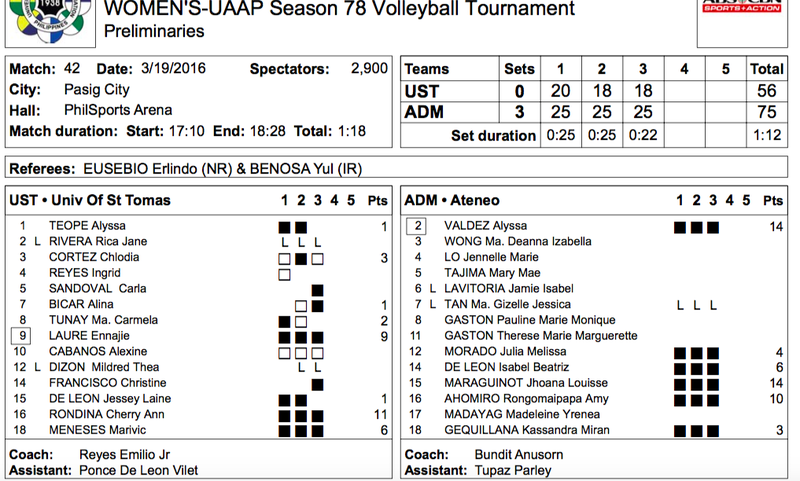 In Season 77, after a bit, Maraguinot began to start over Morente who became inconsistent. Maybe this is that time of the year…. Gequillana came in and served and received well. With more minutes, figure her to contribute more. This past season, it was Ahomiro who has been rather quiet. To make room for the vastly improved Madayag, she went to a utility position. While she played that part under Roger Gorayeb, that was a different Amy as she lacked confidence and conviction. The version of the past two and a half years is one who is fully confident in what she can do. Sliding her into the middle was as natural as anything. 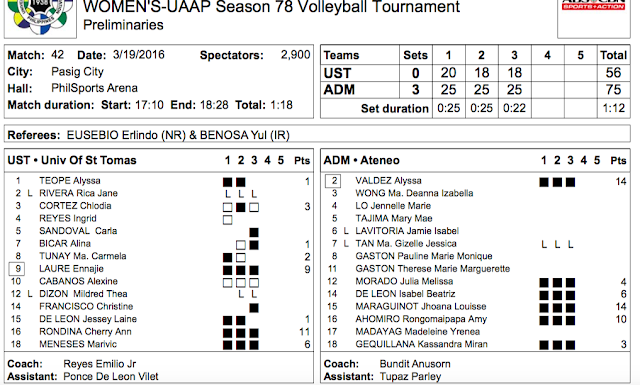 They played like they did during Season 77. Yes, they did. Smiling. Happy. Just focused on the game without having to answer taunts. The back-to-back losses were painful but they sure were wake up calls. 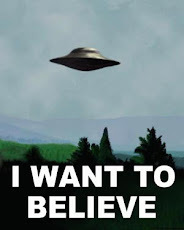 Of course, this season isn’t over by a longshot. The win over UST gave them that first semifinals slot and the schedule is rather kind to them over the next couple of weeks — faltering Adamson and luckless UE with dangerous La Salle to close out the elimination round. This doesn’t mean they should take Adamson and UE lightly. But for now, losses and injuries aside, it was a big win and an even bigger response to the challenges. And they have something to smile about.